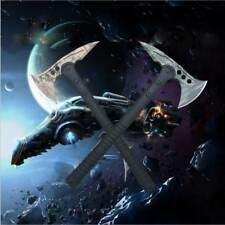 Tomahawk - Hache de survie. Randonnée, pêche, chasse, camping . à propos des évaluations. Tomahawk EAGLE - Hache de survie Aigle. Randonnée, pêche, chasse, camping . à propos des évaluations. Tomahawk - Hache de survie étui. Randonnée, pêche, chasse, camping . à propos des évaluations. 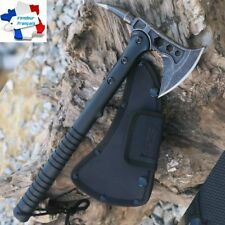 Tomahawk tactique militaire hache ingénieur armée de survie en plein air Hatchet Camping Mountain Fire Machete. Nom: Tomahawk tactique. 1 Tomahawk tactique. Longueur de la hache: 39cm. Largeur de la hache: 19.5cm. Un PCS Camping bois main hache hache. Idéal pour une utilisation camping. MPN a2905 rubber handle camping axe. Idéal pour fendre le bois clair et bois d’allumage. One PCS Camping Wood Hand AXE Hatchet. Great for camping use. Supplied with blade guard. Ideal for splitting light wood and kindling. Tomahawk - Hache de survie Couteau de survie étuis. Randonnée, pêche, chasse, camping . à propos des évaluations. This axe is very useful for carpentry and other outdoor activities, such as hiking, camping, jungle survival, etc. Utility,not just an woodworking axe ,also a wrench ,useful for many siduation. Ax top size: 8.5 (mm). 1 Chilli tail axe. This axe is very useful for carpentry and other outdoor activities, such as hiking, camping, jungle survival, etc. Utility,not just an woodworking axe ,also a wrench ,useful for many siduation. This axe is very useful for carpentry and other outdoor activities, such as hiking, camping, jungle survival, etc. Ax top size: 8.5 (mm). Utility,not just an woodworking axe ,also a wrench ,useful for many siduation. 1 Chilli tail axe. This axe is very useful for carpentry and other outdoor activities, such as hiking, camping, jungle survival, etc. Ax top size: 8.5 (mm). Utility,not just an woodworking axe ,also a wrench ,useful for many siduation. This axe is very useful for carpentry and other outdoor activities, such as hiking, camping, jungle survival, etc. Utility,not just an woodworking axe ,also a wrench ,useful for many siduation. 1 Survival ax. Outdoor camping axe blade protector. Item type: axe blade protector. Suitable axe blade width: about 10.5cm. 1 axe blade protector. Made of high quality PU leather material, durable and practical. 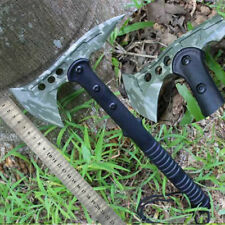 This axe is very useful for carpentry and other outdoor activities, such as hiking, camping, jungle survival, etc. 1 Survival ax. Ax top size: 8.5 (mm). Utility,not just an woodworking axe ,also a wrench ,useful for many siduation. WILD-PRO CAMPING AXE. A very collectible and unique axe. Whilst designed to be visually pleasing, it is very practical, sharp and light weight. -Blade length: 93mm. -Blade thickness: 5mm. -Blade width: 120mm.